Update: We currently do not have any stock of these SD Cards. Like us on our Facebook page to find out when they come back in stock. The Ford range satellite navigation systems with built-in DVD / CD-Player is a great addition to the vehicle with Bluetooth for hands-free calling as well. The satellite is pretty good if you’ve got one that does the postcode finder as well of course, otherwise, in my opinion, we’re better off with a simple £100 TomTom. 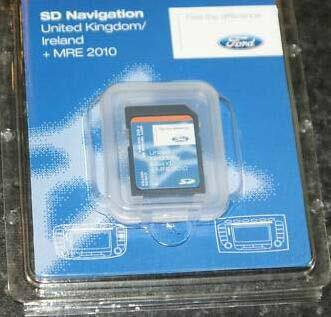 Anyway, one thing we’re getting calls for on these Fords is the SD Card that is read by the Sat-Nav units. The navigation roadmaps and data are all stored on a removable SD card. I guess they made it removable so you could connect it up to your pc/laptop and update it from time to time with the latest updates… it’s a good idea but it means that there’s always a possibility you’ll misplace, damage or just completely lose your SD card and if you do, well then buying a replacement from Ford is Not cheap at all. I don’t see why they couldn’t have just wired in an onboard USB port so that you could hook up a laptop directly to the sat-nav system and update it that way, it would save us a lot of money because the possibility of losing your original SD card would be eliminated. For those of you that have lost your SD card, we do now carry replacements for you in stock readily available. Give us a call, you’ll be pleasantly surprised that we can replace your SD card at a fraction of the cost. It’s always a good idea to keep a backup of your SD card in future. A common fault for the Ford Satellite Navigation units is that the screens fail, rendering the unit useless. Fortunately enough we do carry out repairs on these so if you or somebody you know has this issue, then you can check out our blog on Ford Sat-Nav Systems Screen Failures. Tags : ford sat-nav sd card replacements, ford sat-nav sd cards for sale, ford satellite navigation data card replaced, ford satellite navigation sd card replacements, ford satellite sd cards for sale, ford satnav data card replacements, ford satnav sd card replacements, ford satnav sd cards for sale, ford sd card lost, replacement ford sd card, we sell ford satellite sd cards. I have a 2011 ford focus with a sony built in sat nav Bluetooth radio. I would like to update the system maps as when I set home location it’s ahead of you ie you have arrived at your designation when you are still miles away. Will a updated replacement SD card rectify the problem. Possibly it will help but we’ve seen similar faults and the Satnav unit itself has been found to be faulty. Try updating the SD Card first and if that doens’t work then it may be worth sending your Satnav unit in for testing. I have sent over an email with further information regarding a replacement SD card for your Ford. I have a 2010 Mondeo tdci sport. The sat nav was working fine but now only shows an arrow with a blue back ground. Does it require an update from a ford dealer? Thanks.